President Trump lampooned Washington’s new social-media darling, Democratic Rep. Alexandria Ocasio-Cortez of New York, in an otherwise silly speech in El Paso on Feb. 11. Trump went to El Paso on a scare mission to highlight crimes linked to illegal immigration and rally support for his border wall. 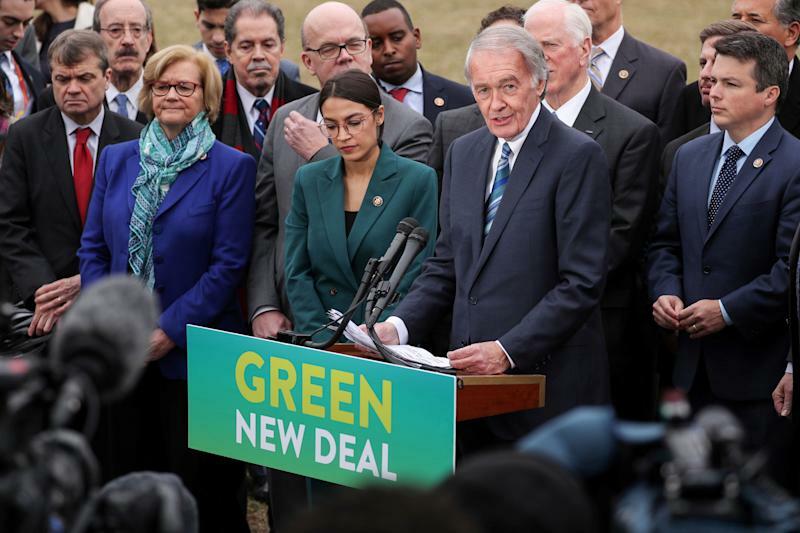 But he changed topics to address the “Green New Deal,” which is legislation introduced last week by Ocasio-Cortez and Democratic Sen. Ed Markey of Massachusetts. It “sounds like a high school term paper that got a low mark,” Trump sneered. AOC, as Ocasio-Cortez is known, fired back, tweeting that Trump “can’t even read briefings written in full sentences.” Eh. Minor burn. But instead of insulting Trump, AOC might want to reconsider the incredibly juicy target she is offering him. She’s making it easy for Trump to look good. The Green New Deal is a wish list of left-wing government fantasies, including many that have nothing to do with environmental protection. It would direct many billions and perhaps trillions of taxpayer dollars into the development of non-carbon energy sources, with the goal of eliminating carbon as a source of energy. There’s no mention of where this magically appearing money would come from or who would decide how it should be spent, except to stipulate that it would be government deciding, rather than private-sector firms. If you’re one of the several million people working in the oil and gas industry, or in transportation, who would lose your job on account of the GND, don’t worry! The GND will “create millions of good, high-wage jobs” in other industries. All you have to do is move to a wind farm or solar kibbutz and learn new skills. If you can’t, there are other safety-net provisions, such as a guaranteed job, with vacations and retirement benefits. Oh, and health care for everybody. Why stop at eradicating the carbon economy when you can also upend the health care industry? Defenders of the GND say these are big laudable, goals, even if the specifics are mushy. Then why not throw curing cancer in there, along with colonizing Mars and finding a team that can beat the New England Patriots? Trump is right: The Green New Deal is as bad as a high school paper. It’s naïve and saccharine. It’s incoherent, since it fails to connect social-justice ideals with progress on environmental protection. It appropriates environmentalism for other purposes, such as advancing the cause of government-run health care. It might also do real harm to the environmental cause, by making solutions to global warming seem all-encompassing and impossible. There are real ways to address climate change, such as a carbon tax and other regulations that create powerful incentives for private firms to find the most effective ways to address the problem. Some of that is already happening, through the adoption of wind and solar power where it makes sense. Somebody should give AOC a ride in a Tesla. Trump went further in his El Paso speech, accusing the GND of “taking away your car, taking away your airplane rights” and forcing everybody to take trains, even to cross an ocean. This is a deliberate misread of provisions meant to transform road and air travel—now dependent on petroleum—into industries driven by cleaner fuel. Earnest defenders of the GND argued that Trump was demagoguing and bending the truth. OF COURSE HE’S DEMAGOGUING AND BENDING THE TRUTH! That’s what he does! It’s remarkable, but apparently there are still people who don’t understand Trump’s modus operandi, and expect him to respond to provocative or competing ideas with calm, reasoned analysis. Perhaps AOC and her acolytes will someday learn that Trump is a political savage who seeks opportunities to denigrate and maim, with no regard for rules or norms. He will take your ball, go home with it, pop it, and hand it to your mother when she complains. The GND ought to be a quickly forgotten freshman mistake. But it won’t be. Several Democratic presidential candidates, including Kamala Harris, Cory Booker, Elizabeth Warren and Amy Klobuchar, support it. And dozens of House Democrats are co-sponsors. The legislation is just a resolution that, if it passed, would be nothing more than a vision document. Still, it’s a ridiculous, utopian vision resembling nothing from the America of the last 75 years. How many other gifts will the Democrats give Trump?